This listing is for 30 Bun in the Oven Cinnamon Roll Soap Party Favors perfect for baby showers. Adorable Mini Cinnamon Roll Soaps just like we made as kids! These soaps look and smell fresh from the oven, and you may be tempted to bite right into them, but remember - they're soap! These are scented in our cinnamon bun scent with buttercream frosting drizzled on top and sprinkled with real cinnamon. WHAT'S INCLUDED IN THE PRICE? 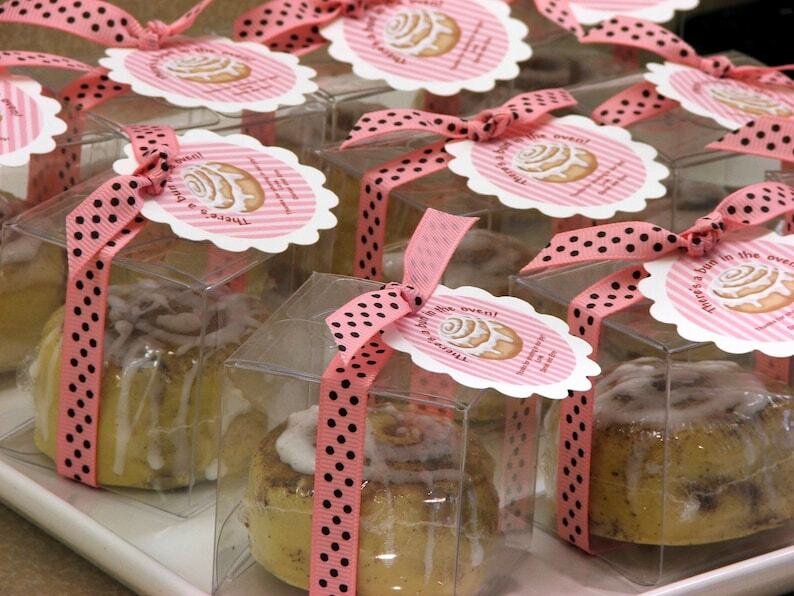 You will receive 30 individually packaged cinnamon bun soaps. These measure about 2" across and are about 1 1/2" tall. Each weighs a little more than 2 oz. 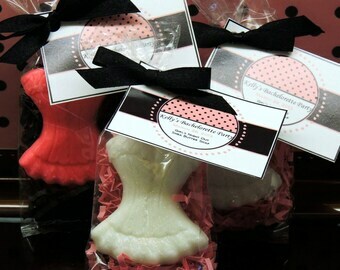 Each party favor will be shrink wrapped and packaged in a clear box with ribbon and tag. As required by law, each soap favor includes the following information printed on the back of the tags to let your party guests know the soap scent, ingredients and our business contact information. For boys - Blue Tag with riboon - There's a bun in the oven Ready to Roll! For girls - Pink Tag with ribbon - There's a bun in the oven Oh So Sweet! Not sure - Green or Yellow Tag with ribbon - There's a bun in the oven! Custom Colors - send a convo to discuss. A rush fee does not expedite shipping, but merely moves your order to the front of production. Shipping time remains the same ( 2-3 days). If we are unable to accommodate your rush order, we will notify you immediately. ***We schedule all orders for production by party date typically apx 14 days before your event date unless an earlier ship date is requested prior to purchasing. If you would like an earlier ship date, indicate the date you would like delivery by in the notes to seller at checkout. We still require a minimum of 3 business days production time for all orders. Orders ship via USPS Priority Mail (2-3 day delivery time). We have your order ready to ship out the week before your party for delivery usually by the Monday before your weekend party.. Tracking information will be e-mailed to your paypal e-mail address when your order ships. ****Please be sure to type all custom information required in the NOTES TO SELLER AT CHECK-OUT***. We will not schedule your order for production until all custom specifics are provided. If we need to contact you, we will do so by sending a convo to your etsy e-mail address.